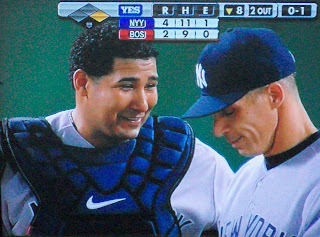 If Jose Molina can crack a smile out of the Majors' tightest manager, maybe he can fix the Yankees' pitching woes. Read Backtime's post on Pinstripe Alley. UPDATE Molina started behind the plate in Phil Hughes' 2009 debut. Hughes worked 6 scoreless IP and the team posted a combined 11-0 shutout. Molina contributed with the bat as well, launching the Bombers' first Grand Slam of the season.